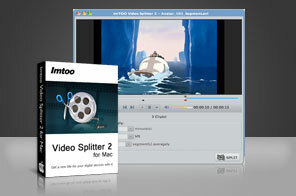 ImTOO Video Splitter for Mac is a highly compatible programme which allows you to split as many segments as you wish from a wide range of video formats. Choose from manual or automatic split options and use our exclusive built-in player to tweak and edit your splits to perfection. Supreme quality and fast conversion speeds make it the prime tool for video splitting. Wide range of editing options will make sure that your video comes out perfect every time. Introducing the ImTOO Video Splitter for Mac, the comprehensive all-in-one product that will cater for all your video splitting needs. As an MP4/FLV/AVI splitter for Mac, it will help you split AVI, FLV, SWF and MP4 media files within seconds into single or multiple segments. ImTOO Video Splitter for Mac fully supports a wide range of video formats including AVI, MPEG, FLV, MP4, WMV, 3GP, H.264, MOV, ASF, SWF, DAT, and many more. Split as many segments as you like from a single video clip. Support over 30 video formats for both input and output, including AVI, MPEG, WMV, MP4, FLV, MKV, H.264/MPEG-4, DivX, XviD, MOV, RM, RMVB, M4V, VOB, ASF, 3GP, 3G2, SWF, H.261, H.264, DV, DIF, MJPG, MJPEG, DVR-MS, NUT, QT, YUV, DAT, MPV, NSV and more. With our built-in media player, manually configuring your split selections has never been easier. Simply use our user-friendly interface to select which parts of the video you would like to split and you're ready to go. On the other hand, you can let the system do the hard work for you by setting it to split the video automatically based on video time, video size, or number of clips. Choose between a wide range of video and audio options such as aspect ratio, bitrate, frame rate, encoding and more to suit your every need. Easily split your videos manually with our easy-to-use interface or let the system automatically split the video based on video time, size or number of clips. Our award-winning design allows you to be in complete control of your video splits. Built-in player conveniently designed for extreme precision. Video editing options allow for user personalization. Available in English, French, German, Italian, Spanish, Japanese and Simplified or Traditional Chinese. Join, merge, and convert multiple video files including AVI, MP4, FLV, MKV, AVCHD, etc. on Mac OS.